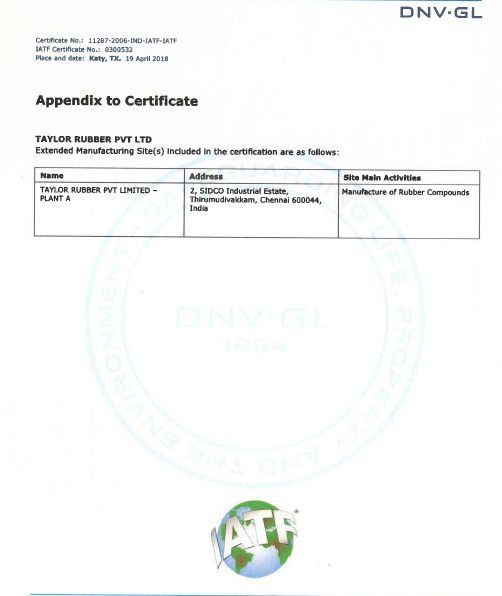 Taylor Rubber has been recertified for IATF 16949:2016 IN APRIL 2018 FOR PERIOD UPTO APRIL 2021. We are committed to bringing about customer satisfaction by meeting and exceeding expectations through supply of quality products at competitive prices at the correct time. We have adopted efficient manufacturing practices with continuous improvement for the effectiveness of our Quality Management System. We are also meeting essential social and environmental responsibilities for the benefit of all our stake holders. 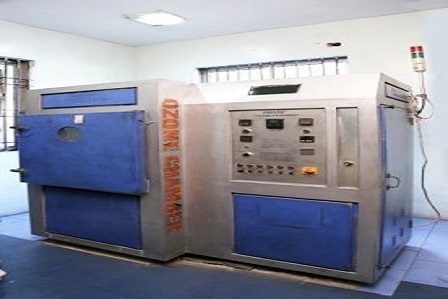 The Company has adopted international standards for Quality Systems and is certified by DNV, HOUSTON, USA for ISO/TS 16949-2009. This provides the basic framework for process driven Quality management. The new product requirements of every customer follow an APQP route, complete with process flow, FMEA, Control Plan etc. 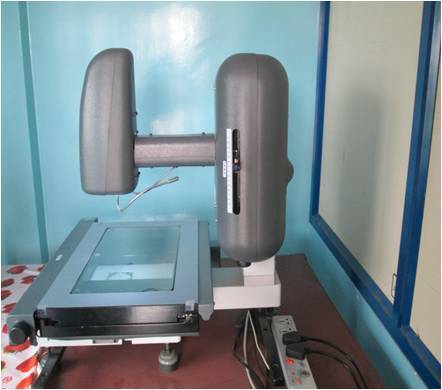 The samples are submitted with all necessary PPAP QUALITY documents. 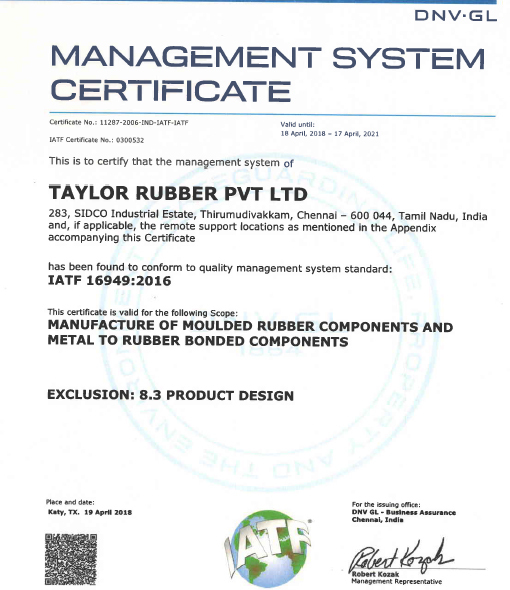 In our endeavour to meet international Quality Standards, Taylor Rubber has adopted the latest management techniques followed worldwide through TQM. TEI (Total Employment Involvement) is visible in the number of KAIZENS (Continuous Improvements) generated. This is a routine activity for the Engineers and Operators who work in teams to achieve desired goals, which are fixed based on Bench Marking from the Best of the Industry data. TPM techniques keep the Plant and Machinery in top performance condition. POKA YOKE, the Mistake Proofing technique, is practiced from design to packing. 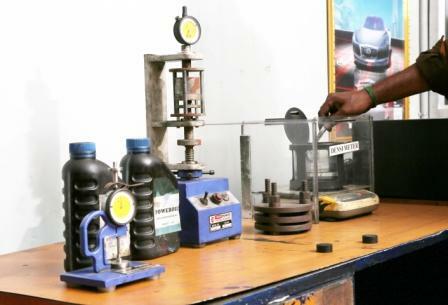 Taylor Rubber is one of the few companies to be selected by the United Nations and the Government of India for the Quality Cluster for the Auto Industry. Our Managing Director, Mr. T.T.Ashok, attended the Advanced Course on STRATEGY AND PLANNING conducted by AOTS (Association for Overseas Technical Scholarship) JAPAN. The knowledge gained by him has enabled Taylor Rubber to become more competitive globally and provide better customer service. Similar training has been undertaken by our Senior Management in Japan in the field of Strategic Production Management. Our Senior Managers are deputed for training under Business Mentoring Services of CII, India. Our managers and staff are sent to visit foreign industrial exhibitions/ trade fairs and also to other organisations. This results in learning new developments in the industry and continuous up gradation of knowledge and skills. 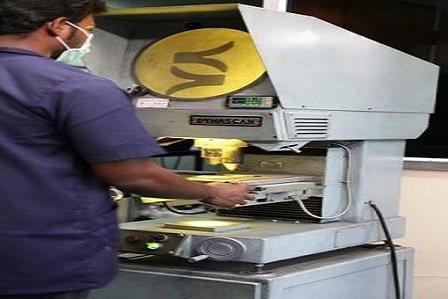 Taylor Rubber always aims for continuous improvement in quality systems and documentation. For this purpose, Taylors hired a senior expert consultant in ISO/TS 16949 for fine tuning and improving the quality manuals and training all key personnel. The company also underwent advanced training with a senior statistical expert in the fields of SPC, FMEA, MSA and other statistical tools. Taylor Rubber has also started an initiative for the excellence in quality of manpower, with the support of a professional HR Consultancy. Taylor Rubber’s growing strength in Productivity and Quality is enhanced by the expert guidance by Mr. Norio Suzuki of AOTS, Japan. Taylor Rubber has successfully completed the Cluster programme- Stage I of TEDO and plans to undergo Stage II programme for better service to overseas customer and higher efficiency. Taylor Rubber aims for continuous improvement in all areas, including in quality systems and documentation. For this purpose, Taylors hired a senior expert consultant in ISO/TS 16949 for fine tuning and improving the quality manuals and training all key personnel. The company also underwent advanced training with a senior statistical expert in the fields of SPC, FMEA, MSA and other statistical tools.